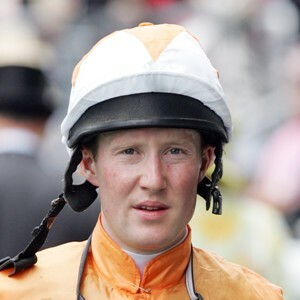 Hailing from Banbridge, County Down, Northern Ireland, Pat Cosgrave rode on the pony racing circuit during his youth and partnered his first winner as a 17-year-old in November 1999. He progressed to become Ireland’s champion apprentice in 2003. In total he spent two years at Ballydoyle with Aidan O’Brien before making the move to Britain in November 2004. Cosgrave has proved particularly adept at riding sprinters. He partnered Borderlescott to victory in the 2008 Nunthorpe Stakes and was aboard Markab in the 2010 Haydock Sprint Cup. He broke his Royal Ascot duck in spectacular style when Society Rock brought him his third Group 1 sprint victory, landing the Golden Jubilee Stakes, the third leg in the Sprint division of the QIPCO Champions Series, in June 2011. 2014 started very badly for him as he has been hit with a four-month riding ban after being adjudged guilty of team tactics in a Group 1 race, the Jebel Hatta, in Dubai. Riding the Mike De Kock-trained Anaerobio, he looked to the inside several times before easing his mount off the rails to allow stable companion Vercingetorix, ridden by Christophe Soumillon, an easy passage through to win. However, the BHA did not reciprocate the ban so he was free to continue riding in the UK. 2015 almost brought his second QIPCO British Champions Series Victory on Tropics in the Darley July Cup, but he was headed in the final strides by Paul Hanagan on Muhaarar. He also finished third in the Investec Derby on Storm The Stars.